If you like space then you probably like NASA and now there is this NASA snapback hat that is perfect for on your head. The orange snapback hat has a cream colored patch on the front which has the NASA logo sewn on it. As this a cool hat and it is adjustable in size you can wear this where ever you go and every time you look up at the sky you know that the NASA is looking with you. 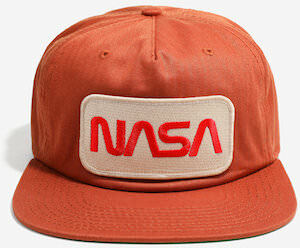 No need for that boring baseball cap you have now because you can now have this NASA Logo Hat. If you are a true gamer that prefers Playstation then you should check out this cap. The baseball cap is light gray in color with black visor and details. On the front of the cap, you will find the Playstation logo. So now you can wear this hat normal or backward and people will know that they can talk gaming with your and this is a snapback hat so that it will fit almost all the Sony Playstation users. Time to get your hat on and you should be thinking about this Sony Playstation Logo Cap. If you are a fan of Mr. Robot then how about a travel mug with the Evil Corp logo on it. 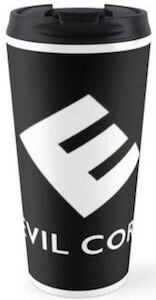 The black travel mug shows a big white E at an angel with below it the words “Evil Corp”. Made from stainless steel this travel mug is just perfect for all the true fans of the TV series and of course you need your morning coffee and afternoon tea out of a perfect vessel and this travel mug could be that vessel as it looks perfect, keeps your drink warm and is much better then a paper cup. Come and order you Mr. Robot Evil Corp Travel Mug. Are you a nerd and you are proud of it? Maybe then it’s the time to put a sticker on it to prove it. 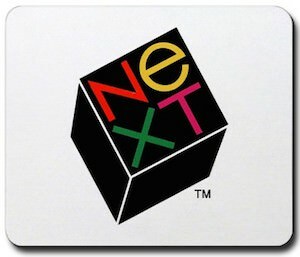 This sticker spells the word “Nerd” and they did it in the style of the Nintendo logo complete with the red border and the rights reserved R on it. And this nerd sticker is great for almost anywhere. It’s a vinyl sticker that last indoors and outdoors so maybe it’s great for on your car, laptop, phone, fridge or maybe for above you bed. Let the world know what you are with this Nerd Logo Sticker. A computer nerd know about the Intel inside logo and this t-shirt shows something that looks a lot like that logo. Instead of Intel Inside it says “Tardis bigger inside” and we Doctor Who fans of course know that the blue box that the Doctor uses to travel is much bigger on the inside. This fun Doctor Who t-shirt comes in a range of styles and colors for men and women and they even have a hoodie if you want that. 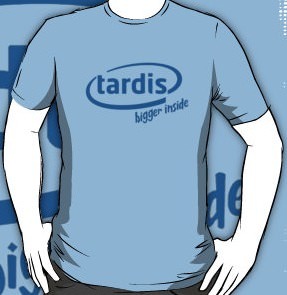 So if you are a true fan of the Doctor and his Tardis then you should check out this Doctor Who Tardis Bigger Inside T-Shirt. OK so you are in to video games and would like gaming t-shirts to fill your closet. But do you have the classics? How about an Atari t-shirt? This black Atari t-shirt is perfect as it has a little bit of a worn look and the colors and layout definitely look retro. The main stripes of the Atari logo is orange and each letter of the word Atari comes in a different color. We geeks should all remember the classics and have something as fun as this Atari t-shirt in our collection. So lets not wait and just order this Atari Logo T-Shirt. OK people have Apple logo’s on their cars but what if you like Atari better? No worries this vinyl decal is the Atari logo and it is in white making it ideal for you car window or anywhere else you would want to see this sticker. The Atari logo decal is 4 x 3.4 inch and will definitely look retro on what ever you now. Come and order your Atari Logo Vinyl Decal. Google’s Android may be a just a friendly phone operating system like Apple’s IOS but this sticker shows that dark side of Android. 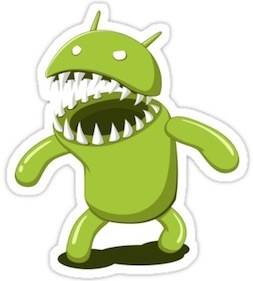 This sticker shows a green Android but this one is ready to attack it even shows it’s white pointy teeth. This Android sticker is die cut so that it would look great on almost anything and it is weather proof so you could even stick it on your car. Come and have a closer look at this Android Showing It’s Teeth Sticker. Doctor Who fans will love this poster. This is not just a poster no it is a poster of the Tardis and it is big as big as a door so that you can decorate your rooms door as the Tardis of the Doctor. On the poster you don’t see much more then a big picture of the Tardis and the Doctor Who logo. The Doctor Who poster is 21 x 62 inch and of course is shipped in a sturdy tube. If you want to make people believe that they enter the Tardis instead of your room then this door poster is the perfect way of doing that. Come get your own Doctor Who Tardis Door Poster.